Rainy is Now a Certified Therapy Cat! 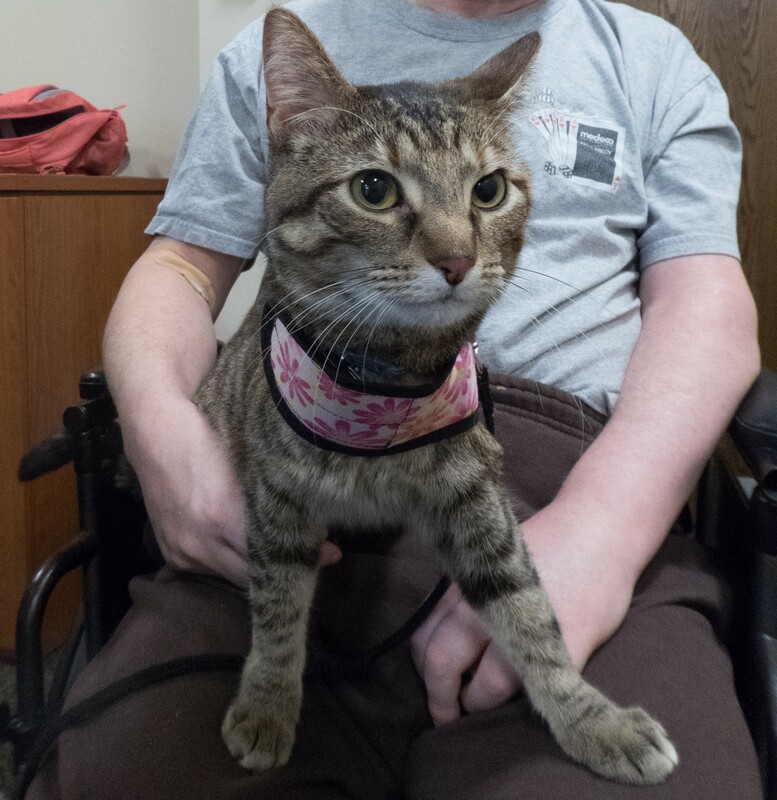 Therapy Cat Series: Our Therapy Cat Adventure Begins! Therapy Cat Series: An Ambassador for Happiness! This post is one in a series of three being reprinted for the Companion Animal Psychology Train for Rewards Blog 2018, which will officially run June 14-16. Although training methods are directly referred to here, training is an essential part of cats both receiving and keeping their certification. “Rainy’s come to visit again!” I hear this excited cry as Rainy and I start our therapy cat rounds. Since I last posted about Rainy’s therapy cat adventures, Rainy and I have completed four more supervised rounds. Although Rainy continues to have her off moments she’s growing in her role as an ambassador of happiness. At one senior residence, Rainy and I pick which seniors to see and how long to stay. We started with just one senior, now we we’re up to four. One lady is very familiar, as we’ve been seeing her regularly since January and we’ve swapped many stories. She grew up on a farm with cats, but then got dogs when she got married. On our most recent visit, I heard several personal and sad stories about her family but also the happy news that one of her daughters was moving back to town. Two other ladies are less familiar, as we’ve only been visiting them since March. The first time we dropped in on one lady, she smiled at Rainy but barely talked. The second time, I came prepared with more stories and questions, with the result that I received longer answers. As I left her room the last time we visited, I encountered a man who expressed delight upon seeing Rainy. I asked if he wanted us to come by his room, and he said yes. As we entered his room, he told me that he misses his cats and wishes that he could have one now. While he held and petted Rainy, we talked more about cats. He expressed sadness about the homeless cats, and shared memories of his own cats. I promised that we’d return. On our way out of the building, we met the activities director. She told me how popular Rainy is, and how she’s all anyone can talk about the day after we come. At another senior residence, those interested in meeting Rainy sign up for a 15-minute time slot, and the visits take place in a common room. There are three regulars, along with a few who sign up occasionally, and always one or two new folks. A visit early in March went particularly well. One lady proudly shared that after seeing the tricks Rainy can do, she’d taught her cat to sit. She invited me to come to her room, so I could see for myself. Another lady said she almost didn’t come because of her migraine.” Rainy allowed the woman to hold her close during the entire visit and, by the end, the woman’s migraine was gone. Such is the therapeutic power of cats! A third lady had just celebrated her birthday and wanted hugs from Rainy. Finally, a gentleman who used to own cats before moving into the senior residence might now want to pay the hefty pet deposit so that he can have a cat again. On my most recent visit to the senior residence with Rainy, we had more positive experiences. One lady shared that she really wanted to adopt a cat, but she couldn’t afford it, and so we talked about the alternative of fostering a cat. As Rainy and I stroll the hallway between visits, a gentleman passing by expressed admiration for a cat on a leash. I invited him to spend time with Rainy, which he did until the next scheduled visitor. Later, as I prepared to leave, I ran into a lady who wanted to share stories about her cat. As we talked, another lady stopped to see Rainy. She then expressed an interest in signing up for Rainy’s next visit. The first lady then extended an invitation for the second lady to meet her cat too. When I left, the two were making plans to get together! Rainy and I have now completed twelve supervised therapy rounds. I love that our cat therapy work is strengthening our bond. Just as much, I value the opportunity it gives us to show how amazing cats are and answer questions about cat care. Rainy does more than make people happy–she’s an ambassador for cats! Cat therapy is a win-win on all levels! Stay tuned for future updates, and email me at allisontalkspetsATgmailDOTcom if cat therapy interests you. Reprinted with permission from Lincoln Animal Ambassadors Pet Talk. This article is original in content and not to be reproduced without permission. Copyright 2018. Therapy Cat Series: Our Adventure Begins! 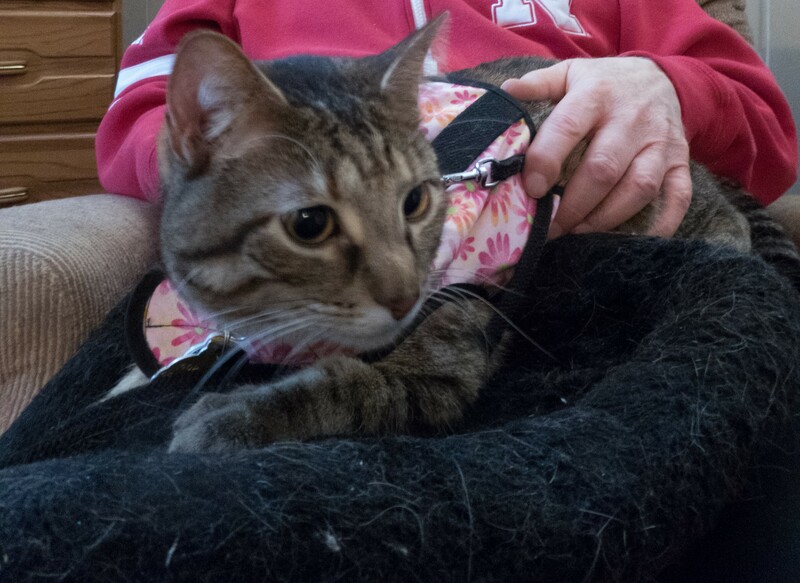 4 Responses to "Therapy Cat Series: An Ambassador for Happiness!" What a lovely post, and such a great thing to do. I bet everyone looks forward to visits from Rainy! Thanks for the compliment! The seniors we visit are always happy to see Rainy and talk about her after we leave. Thanks for accepting me to the blog party. Pet therapy is a great reason to train a cat and also makes a great use of training! What a wonderful thing you both are doing. Bless you and Rainy. Thanks for posting this to Feline Friday. 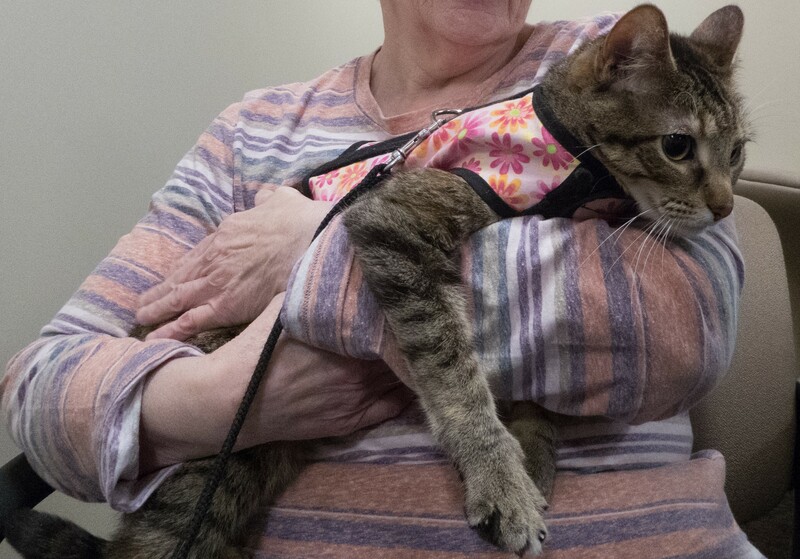 Pet therapy is a great way that animals can help people. Many more therapy teams are needed!